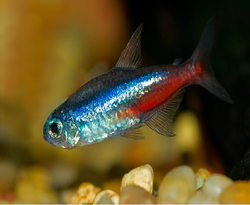 The Neon Tetra fish is one of the most attractive of all the readily available tropical fishes. We have Wholesale dealer of Planted setup fishes in Chennai. We are supplying Tetra Fish, which originally came from the clear water streams of south america. This fish has a clear body with a bright neon red stripe running from the nose into the tail. The neon tetra is a freshwater fish of the characin family of order Characiformes. 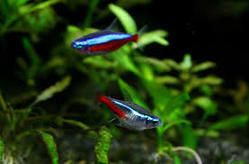 - Black Tetra is also known by other name black widow or black skirt tetra. Hi, the following in stock : Neon tetra Red phantom tetra Rummy nose tetra Dwarf Rainbow Gourami German Blue Ramirezi - L Golden Ramirezi - L Cribensis - M Tiger loach Albino bristle nose pleco 1.5" Black veiltail bristle nose pleco 1.5" Jet Black shrimp Red coral platy Demasoni cichlid 1.75 " Anubias minima Fine white sand Fine river sand Laterite soil.